/ Home / Resilient Cities | What makes a ‘Resilient City’ and why are they so important? What is meant by a Resilient City? Resilience in cities refers to future proofing. How our cities will grow and operate in years to come is our responsibility today. Globally, we must roll out systematic improvements and new processes as well as implement operational change so that in years to come, our cities and their infrastructures can better cope with the economic, social and environmental challenges they will inevitably face. When researching the public’s understanding of ‘resilient cities,’ Sentronex found some people think of disasters, defences and recovery, others focus on social cohesion and then there are those who associate the buzz phrase with risk and how to reduce it. Every one of these areas is key. In essence, when discussing a city’s resilience, it is about addressing all these factors. Before continuing, it is important to note that despite taking resilience-building action to improve the future of our cities, it is impossible to future proof them entirely. Why is resilience in cities so important? The answer is simple: we need cities both socially and economically. There is no hiding from the facts. • Economics – an estimated 80% of global GDP is generated in cities. They are central to global economic development and will drive the future. • The cost if we don’t – Between 2000 and 2012, natural disasters including weather, health and seismic events caused over £.1.1 trillion in global damages (view source: Toolkit for Resilient Cities – research project by Arup, RPA and SIEMENS). • Growth in the urban world – reports suggest that 70% of the world’s population will live in cities by 2050. This figure is up about half from 2009. Every second, the world’s cities grow by two people (view source: The Crystal Website). If we fail to improve urban resilience, the price we pay will be enormous. In future decades, as more people migrate to the cities, the cities’ infrastructures will be under even more pressure. In turn, when the unexpected does occur, the cost of the damage will plummet beyond any prediction we could make today. Resilience should therefore be seen locally and regionally, internally and externally, extending to a wide range of known threats that if not dealt with could weaken the fabric of a building or an entire city, potentially impacting on the structure of our societal safety & security. Who is driving the resilience? Ongoing, global campaigns by charities, groups and organisations are helping to get resilience in cities talked about. Multiple corporations are not only tackling the problem but are encouraging a wider audience to think about resilience, what it means, and why it is so important. “Cities depend on the effective and reliable operation of infrastructure systems to deliver energy, mobility, water, sanitation, shelter, information, emergency response and other critical services. Across the globe, governments, business and communities are seeing an ever-increasing frequency of extreme weather-related events. These events are playing out against a backdrop of global population growth and urbanisation. What are the biggest risks to a city’s future resilience? 1. Climate – natural disasters and unpredictable weather are products of climate change. 2. Environmental Capacity – do our cities have enough space to accommodate the changes? 3. Resource Capacity – can the resources available support the growth? We must reduce our dependence on oil and other fossil fuels and find ways to be more self-sufficient and energy efficient. 4. Infrastructure – are our cities running the right technology to be able to cope with future growth? What about safety, security and privacy in our hyper connected world? 5. Community – with increased numbers, health and welfare in the cities becomes a concern. Fighting against these main areas of risk is not solely the job of global governments or the large organisations listed earlier; people and businesses within our cities should take on some of the responsibility too. With a better understanding of the definition of ‘resilient cities’ and its importance, we can now address the impacts of a changing urban landscape on businesses and the cities and what the people and organisations can do to help improve the future. 1. 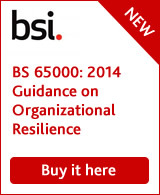 What is the right context for my business resilient? 2. What does my business need to be resilient to? 3. Who benefits from my business resilient? For the purpose of this piece, we have chosen two scenarios to highlight the difference between questions 1- 3 above. Despite them sounding similar, they are in fact very different. 1. The River Thames – it runs through London and the rest of southern England. London can improve its resilience to flooding further by continuing to invest in The Thames Barrier, protecting 125 square kilometres of central London. But what effects will this have further down the river? By improving resilience in one city, what negative, resilience-decreasing effects might this have on other cities, towns and villages nearby? To simplify, London and its businesses would be resilient of flooding and this would positively impact the capital’s population. However, London wouldn’t be resilient to the Thames entirely – it could pose other problems in the future such as health risks. 2. The Office Building – your business operates from the 26th floor. Central management for the entire building has completed measures to drastically improve your resilience to fire, theft and flooding. But how well equipped are your neighbours? Surrounded by very old property, what risks do other buildings pose to you? In other words, your business would be resilient to fire, theft and flooding and this would positively impact your business and its people. However, your business would not be resilient of your neighbours nor the rest of the city. When it comes to risk and resilience for businesses, every aspect and every action seem to create a ripple effect. When talking about resilience in both cities and businesses, no aspect can be ignored. To be effective in tackling the next 50 years of urban change, the key is working together with a combined perspective that plans for as many economic, social and environmental situations as possible. “Building resilience is not the task of a single actor or a single sector. We need governments creating the right policies, plans and infrastructure investment; businesses to take on some of the risk – and through innovative financing, reap some of the rewards; communities that are flexible, responsive and robust; organizations and individuals who have the core skills required to adapt and cope – and philanthropic dollars to catalyse change”. So what are the main challenges faced by businesses operating from our cities? How can a business be more resilient? We have to start somewhere. If more and more firms prioritise resilience, they will become part of a global puzzle planning for the people, businesses and cities of the future. • Alternative Work Area Recovery – consider entering into reciprocal arrangements with clients or partners to use their space facilities in the event of a disaster. Alternatively, look to establish an arrangement with a service provider offering Disaster Recovery solutions including alternative work area recovery. • Training – train a cross section to staff in business-critical procedures to ensure minimal disruption when key employees are absent. • Due Diligence – carry out the necessary checks on key suppliers and service providers to ensure they have resilient continuity plans in place that support yours. • Talk to the Experts – the risk, resilience, business continuity and Disaster Recovery industry is booming. There are specialist consultants trained to make your life easier when it comes to company-wide resilience (and you can always speak with the Continuity Forum to get help and maybe get involved in some of thewider work we are engaged in). • Match contingency plans to operations – protect your reputation and ensure privacy policies and technical security procedures reflect your businesses profile and the contingency plans you have in place. False claims could jeopardise the business’ reputation and how it is recognised by stakeholders. Looking closer to home, is London a Resilient City? The answer is, not yet. London still has a long way to go until it is competing with the likes of Toronto, Vancouver and Calgary – three cities in Canada rated the least vulnerable and most adaptive cities on the planet. Or even Curitiba, Brazil, often referred to as the ‘poster child’ for sustainable urban revitalisation, or Copenhagen, Denmark, a city where 40% of its citizens cycle and with political commitment so strong they seek to be the first major capital city in the world to achieve carbon neutrality by 2025. That said, the Canadian cities, Curitiba and Copenhagen are very different to London. The capital is extremely densely populated making the roll-out of change and the process of operational migration arguably more difficult. However, despite these additional hurdles, there is no shying away from the fact that London needs to be doing more. The capital is a financial hub in global markets – a fact that makes its need for resilience all the more significant. We need to protect the city’s longevity in business. What London does have is political and social commitment to the cause. Government, businesses and communities are actively working towards a low-carbon economy as a medium to improve the city’s infrastructure. As an example, since 2003, the introduction of the congestion charge zone has been successful in reducing traffic, increasing revenue for public transit and continues to encourage greener vehicle purchases. Going forward. it is important that the British government establishes a wider view on resilience and makes public its plans for geographical-specific climate change issues, cyber threat and security, energy and technical infrastructure improvements. While businesses often prepare for upgrades and maintenance, the same should be expected of a city and London is no exception.